(Nanowerk News) Stanford University scientists have invented a low-cost water splitter that uses a single catalyst to produce both hydrogen and oxygen gas 24 hours a day, seven days a week. 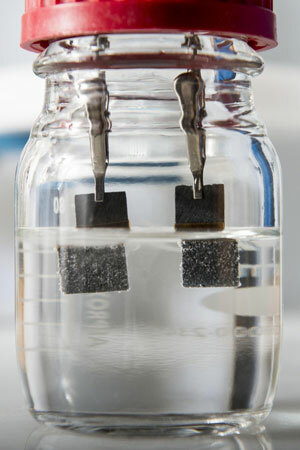 The device, described in a study published June 23 in Nature Communications ("Bifunctional non-noble metal oxide nanoparticle electrocatalysts through lithium-induced conversion for overall water splitting"), could provide a renewable source of clean-burning hydrogen fuel for transportation and industry. 'We have developed a low-voltage, single-catalyst water splitter that continuously generates hydrogen and oxygen for more than 200 hours, an exciting world-record performance,' said study co-author Yi Cui, an associate professor of materials science and engineering at Stanford and of photon science at the SLAC National Accelerator Laboratory. In an engineering first, Cui and his colleagues used lithium-ion battery technology to create one low-cost catalyst that is capable of driving the entire water-splitting reaction. Hydrogen has long been promoted as an emissions-free alternative to gasoline. Despite its sustainable reputation, most commercial-grade hydrogen is made from natural gas, a fossil fuel that contributes to global warming. As an alternative, scientists have been trying to develop a cheap and efficient way to extract pure hydrogen from water. Wang used electrochemical tuning -- putting lithium in, taking lithium out -- to test the catalytic potential of several metal oxides.